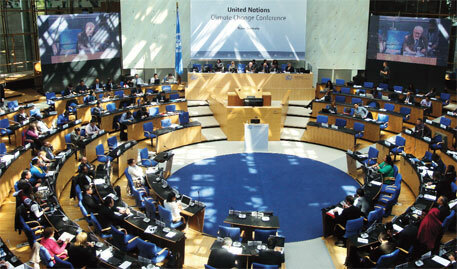 THE latest round of climate talks concluded recently in Bonn, Germany. The talks were to firm up the process leading to a new global deal on climate change. But by the end of the meeting, it seemed the target of arresting global temperature rise to under 2°C remained out of reach because developed (Annex I) countries continued to try to transfer the burden of reducing emissions on to developing countries (non-Annex I). During the 2011 talks in Durban, countries agreed to framing of a deal by 2015 by the Ad hoc Working Group on the Durban Platform for Enhanced Action (ADP). They also agreed the deal would be applicable to all and would be under the principles of the United Nations Framework Convention on Climate Change (UNFCCC) (see ‘Time out’, Down To Earth, December 16-31, 2011). ADP, which has to implement the deal by 2020, currently has two work streams—one is focused on the 2015 deal and the second on raising mitigation targets until 2020. The Bonn talks reflect that several issues continue to pose a challenge under both the work streams. The US said it would not adhere to the existing arrangement of the annexes which underlines differentiation, where developed countries have to act based on their historic responsibility of causing greenhouse gas emissions and developing countries have to take action based on the financial and technical support they receive from the developed countries. For the second work stream, which focuses on raising mitigation ambition until 2020, there was some convergence on areas countries should look into. These include how to switch to a low-carbon economy, phasing out fossil fuel subsidy and moving of hydrofluorocarbons (HFCs), greenhouse gases used in refrigerators and air-conditioners, to the Montreal Protocol. Developing countries stressed that renewable energy projects require huge investment costs and committed financial support would be required if the sector is chosen as the pathway to a low carbon economy. On fossil fuel subsidy, India said the issue is closely linked to food security and so it needs to be carefully examined. “There is significant agricultural farm subsidy given in the developed countries and this has inbuilt fossil fuel subsidy. In the developing countries such subsidies are a policy response to securing food and energy for the poor,” said Indian negotiator R S Prasad. On HFCs, developed countries said since the gases are a result of phasing out ozone-depleting substances such as hydrocholorofluorocarbons, they should be discussed under the Montreal Protocol, which regulates ozone depleting substances (see ‘Climate of irrationality’, Down To Earth, September 16-30, 2012). The EU added HFCs can contribute to 20 per cent of global emissions if left unchecked. “The Protocol has a proven mechanism for phasing down emission of gases in this sector and we (UNFCCC) should be the forum to encourage them to take action… under Montreal Protocol,” it said. A developing country negotiator rejected this as a case of “unilateral thinking”. Clearly, the bulk of the issues under both work streams remains to be resolved. For now, they have just been transferred to the next round of climate talks in June.